Hello, it’s really good to be back again! It’s been a long time, hasn’t it? I think the last time I was here speaking to you was back in 2010. And I think it’s no coincidence that the topic of that episode was procrastination and perfectionism. I’m not going to bore you with a bunch of apologies and explanations; I think it’s better to just dive right in with a new conversation. But before you listen, you’re going to need some background context. So here’s what I think it will be helpful for you to know as you go in to listening to the conversation. You’re going to hear me and my mom. And we are at my sister’s house in Santa Barbara, California. It’s early in the morning. In fact, I think we were meeting in the kitchen to get our first cup of coffee and we were still in our pajamas! The night before, I had burned my arm really bad when I was trying to make a cup of tea. And it wasn’t a serious burn; I didn’t have to go to the doctor, but it was super painful. So in the conversation, you’re going to hear how my mom tried to help me and whether or not she was successful. So if you’re ready, let’s get the ball rolling and get right into the conversation! Lori: Oh my gosh! That aloe vera stuff is freaking witch-doctor voodoo magic. M: I’m so glad! Really! L: Seriously. Seriously, look! [Lori displays her burn] You can see…you can barely see it. 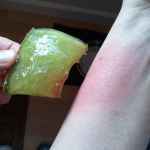 Does aloe vera really help if you burn yourself? M: …and I’ve never tried it because I’ve never had a burn like that, but I mean, any port in a storm, it’s all we had. M: I know, I could tell you were almost losing it. Want to read the rest of the conversation?